There has been a great decline in the price of Bitcoin and Ethereum for a while now and this has been very troubling to crypto investors. Apart from the constant fall in price, mining rewards are also falling, existing low transaction processing times, energy inefficiency and also scalability. The initial aim of Bitcoin and Ethereum using Blockchain technology is to build a world where there will be no restriction to cross-border transactions as they will be instantaneous and free having no form of interference either from banks or any other authorities but with the current challenges which the cryptocurrency market faces, one is forced to ask if this aim will be achieved in due time. A close look at Ethereum network showed clearly it is facing several challenges which needs to be addressed as soon as possible to create a better system for all. These challenges includes centralization, rental storage fees, declining rewards, scalability and difficult bomb (special piece of code introduced to Ethereum that has made it more difficult and less efficient in producing new blocks. These issues which have been troubling the minds of crypto investors a long while caught the attention of some high intelligent smart experts who have come together to give the world a long lasting solution to make cryptocurrency a lot easier to use all across the globe. 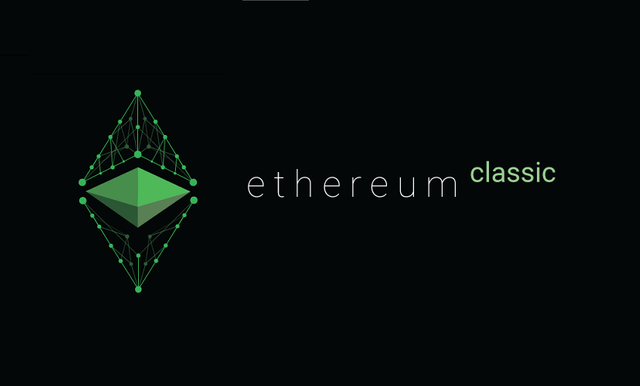 These experts came up with the Ethereum Classic Vision idea which will bridge the divide of expectations and reality. To preserve the decentralization idea and leverage most advanced solutions proposed for world’s second largest digital currency, a hand fork of Ethereum is needed. Ethereum Classic Vision combine unique technologies including P2P asset exchange, dApp development tools, sharding, and also a decentralized file storage which uses IPFS. Ethereum Classic Vision is built as an advanced, fast, easy-to-scale highly decentralized system. Ethereum Classic Vision will develop a platform that will initially use PoW but later switch to PoS. Ethereum Classic Vision will be able to execute more decisive and confident transition with PoS which uses one block out of 100 validated unlike Ethereum which goes through lengthy partial testing stage. • Fair distribution of rewards. See the whitepaper for more details about the above listed advantages; https://ethereumcv.io/whitepaper.pdf. Kindly visit the whitepaper https://ethereumcv.io/whitepaper.pdf for more information about the features of Ethereum Classic Vision. After a snapshot which has been scheduled to hold on 11TH January, 2019 (20:00 GMT), the initial distribution of free Ethereum Classic Vision will take place. All users who have Ethereum coins as at the time of the snapshot in their private wallet will get to receive free Ethereum Classic Vision coins at 3:1 ratio. Upon completing the snapshot, ETH holders can then dispose of their coins. NOTE: only ETH stored in personal wallets (desktop, mobile, or cold storage) will be eligible for free ETCV after the hardfork. Q3-4 2018: ETH hard fork ideation & development; formation of the team; negotiation with and signing up first advisors. January 11, 2019: Snapshot of the ETH network & distribution of Ethereum Classic Vision coins. Q1 2019: Introduction of the dApps platform (initially with new dApps residing on the mainchain and support for migration from Ethereum and Ethereum Classic virtual machines); establishment of key technological partnerships; listing Ethereum Classic Vision at a number of major digital exchanges; testing the P2P exchange module VisionDEX; security audit of VisionDEX smart contracts; expanding the team and adding more developers; launch of a large-scale marketing campaign. Q2 2019: Implementation of the P2P decentralized exchange module; onboarding of an advisory board specializing in sharding and decentralized storage system based on IPFS; testing the PoS consensus protocol; roadshow covering major coding events and hackathons in Europe and Asia. Q3 2019: Switch to the PoS consensus protocol; integration of the dApp platform with VisionDEX; Sharding implementation; testing of the file storage module and the associated rewards system; attracting advisors from the field of the zero-code movement. 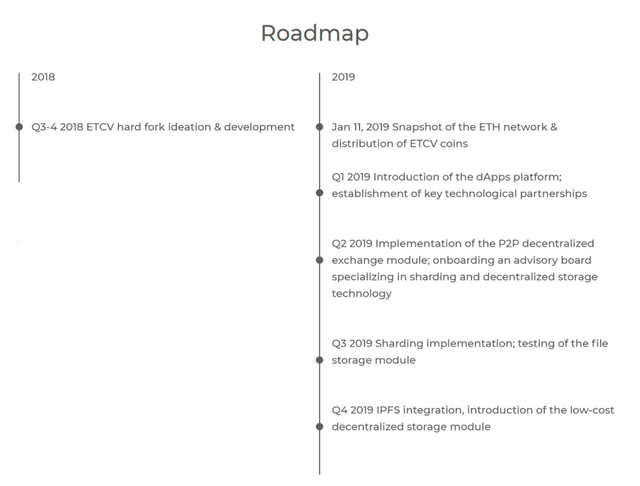 Q4 2019: IPFS integration with rewards for storage space provides, launch of a marketing campaign for the storage system; establishing partnerships with blockchain foundations in North America and East Asia; expanding the number of digital exchanges where Ethereum Classic Vision is listed. Q1 2020: Beta testing of additional features for VisionDEX (margin lending, limit orders, etc). Q2 2020: integration of new exchange features; stop-loss, limit orders, margin trading; implementation of a Sidechain Development Kit for the dApp platform. Q3 2020: Implementation of cryptocurrency derivatives trading; introduction of a migration tool for the dApps developed outside of EVM (NEO, EOS Lisk, Stratis). Q4 2020: Integration of a zero-code, drag-and-drop dApp development module.